Gerrit Adriaensz. Berckheyde. 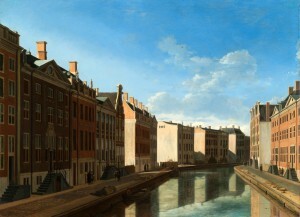 The “Golden Bend” in the Herengracht, Amsterdam, 1671-1672. Oil on panel. Rijksmuseum, Amsterdam. Courtesy of Rijksmuseum, Amsterdam. This is the theme behind the Peabody Essex Museum’s latest exhibition, Asia in Amsterdam: The Culture of Luxury in the Golden Age. Presented in collaboration with the Rijksmuseum in Amsterdam, curator Karina H. Corrigan has brought together more than 200 works of art, presenting the profound impact that the Asian import trade had on the Netherlands. 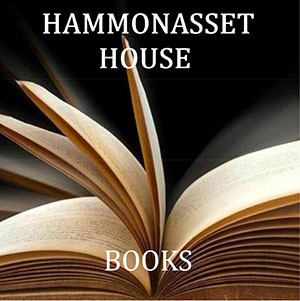 As the PEM’s H.A. Crosby Forbes Curator of Asian Export Art, Corrigan has access to some of the most brilliant examples of this art revolution in paintings, textiles, ceramics, silver, lacquerware, jewelry and more — and I had the good fortune to be given a personal tour by the curator, herself. Set in the same gallery space as Theo Jansen’s Strandbeests previously occupied (though you’d never know it by how they have transformed the space), the viewer is immediately immersed in unequaled sensory stimulation. 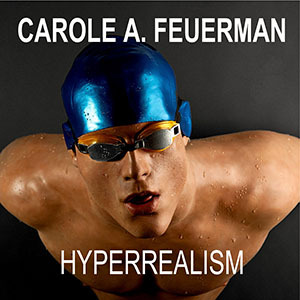 Corrigan mentioned that one of her main goals for the show was to hit the viewer on all senses, not just visually but also through sound, and even smell. Right: Plaque. Delft, The Netherlands, 1670-1690. Tin-glazed earthenware (faience). Rijksmuseum, Amsterdam. Courtesy of Rijksmuseum, Amsterdam. As you enter the space just outside the main doors, a recording of 17th century music along with speakers interacting in both English and Dutch is paired with large glass jars filled with aromatic spices. This is the first nod prompting this tidal wave of cultural exchange; the demand for spices. In particular, pepper. The Dutch East India Company (Verenigde Oostindische Compagnie or VOC) was the number one importer of Asian goods and at the height of their career 40% of all mercantile vessels on the water belonged to them. Once established to transport spices from the Maluku Islands in Indonesia, the trade quickly expanded to textiles, lacquer, porcelain and even human slaves. Interestingly, it is this organization that tightly links Amsterdam to Salem, Massachusetts. Salem’s East India Marine Society opened America to the wider world, and was the forerunner of the PEM. Indeed, the PEM and its european counterpart, the Rijksmuseum, were founded only one year apart, in 1798 and 1799, respectively. Right: Cradle. Coromandel Coast, India, 1650-1700. Ebony and ivory. Rijksmuseum, Amsterdam. Courtesy of Rijksmuseum, Amsterdam. This common bond has afforded Corrigan the opportunity to acquire some of the rarest pieces for this exhibition, borrowing not only from museum collections, but even from Queen Elizabeth and King Carl XVI Gustaf of Sweden. It is actually his Majesty’s piece that welcomes you into the first section of the show, immediately setting the tone. The enormous domed chest is the earliest documented piece of Japanese lacquer work tied to the VOC, and was present as a gift from the organization to the Swedish Patriarch in the early 1600s. 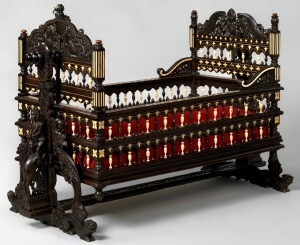 The stunning piece is still part of the royal family’s private collection and has rarely been displayed for the public. Set against rich black, blue, and deep red walls every piece in the space speaks its exotic allure quite clearly. Materials ranging from mother of pearl, lacquer, porcelain, gold and even fiber are worked into each item with craftsmanship that can still be appreciated today. Right: Jacob Jansz. Coeman. 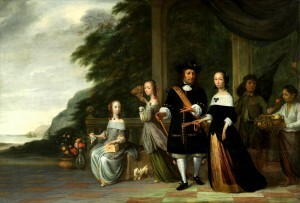 Pieter Cnoll and Cornelia van Nijenrode with Their Daughters and Malay Slaves, 1665. Oil on canvas. Rijksmuseum, Amsterdam. Courtesy of Rijksmuseum, Amsterdam. Corrigan took a very interesting approach to the organization of the space, breaking it down into sections based on different personas that would have had an impact at the time. This includes innovators, tastemakers, freedom fighters and more, with each giving a different view of the impact that the Dutch had on Asia, and visa versa. The exhibition also boasts a number of interactive displays, something that the PEM always delights me with, and Corrigan made excellent use of them. An animated map illustrates the vast distances and complicated routes that the mariners would take in their journey from the Netherlands to their ‘home away from home’, Batavia (modern day Jakarta) stopping at some of their 600+ trade stations on the way. These were found not only on mainland Asia, but spanned the Cape of Good Hope, all the way to Japan. Left: Covered bowl. Jingdezhen, China. Porcelain. Peabody Essex Museum, Salem. © 2010 Peabody Essex Museum. Photo by Dennis Helmar. “One can only imagine the delight and amazement that these imports must have inspired in the Netherlands. They brought new color, pattern, and texture to interiors that were otherwise fairly monochromatic and spare. These luxuries also offered new tactile delights, such as drinking from a cool, thin, porcelain cup or wearing a vibrantly colored and weightless chintz gown, instead of the customary wool or linen. Independent of their place of origin, these objects were wonderful. But, then know that they came from halfway around the world made them even more interesting.” Said Corrigan. These objects still inspire delight and appreciation for a culture that was at one point seen as nearly magical in its differences. I was engrossed in the detail work of carved ivory and delicately painted porcelain, and adored the depictions of the Dutch traders in Japanese prints. Each and every one was red haired with blue eyes, comically large proportionally and sporting wooden clogs. It wasn’t just the Europeans that thought the ‘others’ were exotic and strange. These interactions weren’t always as lighthearted as some depictions can seem, and often the real impact of the trade relationship is overlooked in history. Corrigan’s aim to make sure these realities weren’t dismissed in the exhibition includes a large portrait of the Governor General and founder of the Dutch city- state Batavia, Jan Pieterszoon Coen. Set it an extravagant gold frame, the imposing face of the Governor stares out over the objects collected and housed in the area he oversaw, but the Governor has more than a spot of blood on his hands. Right: Flower pyramid. Delft, The Netherlands, about 1690. Tin-glazed earthenware (faience). Rijksmuseum, Amsterdam. On loan from the Koninklijk Oudhheidkundig Genootschap. Moving forward through the gallery, we come across another example of the hardships placed upon the indigenous peoples the Dutch encountered. In the painting Pieter Cnoll and Cornelia van Nijenrode with Their Daughters and Malay Slaves, the viewer sees the ways these two cultures have merged. While the family is dressed in the European style, scattered throughout the painting are nods to the various cultures the VOC, who Pieter Cnoll worked for as first chief merchant, touched. A pekinese dog, a Japanese fan in one of the girl’s hands, a intricately carved box from Ceylon and even Cornelia herself are all evidence of the family’s hybrid lifestyle. She was actually the daughter of a Japanese Courtesan and a Dutch trader. There are two other figures in the painting aside from the family, both of whom are slaves. The male figure holding the umbrella, identified as Untung, was part of the household even after the patriarch passed, though according to Corrigan he didn’t get along well with Cnoll’s son and ran away shortly thereafter. Untung later went on to fight in rebellions against the Dutch colonialism and for the native people’s freedom. Left: Paulus Moreelse. 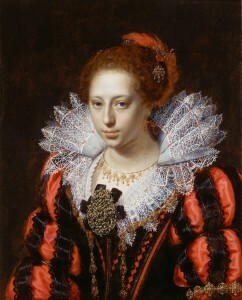 Portrait of a Young Woman, about 1620. Oil on panel. 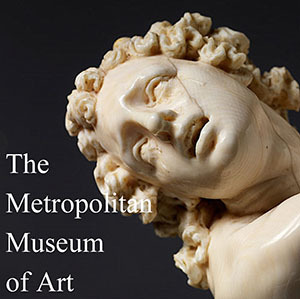 Art Institute of Chicago, Max and Leola Epstein Collection. Photo by Jacques Breuer. While the relationships between the European traders and those that they encountered has an undercurrent of exploitation, the fact that the exposure also created undeniable beauty can’t be ignored. 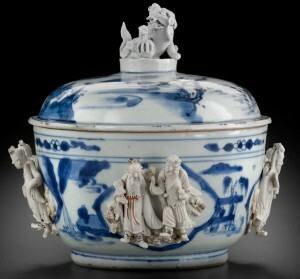 Before the VOC brought fine Chinese porcelain back to the Netherlands, ceramics were mostly earthenware and thus heavy. One of the other interactive displays in the gallery demonstrated the difference between what the Dutch had been using and the luminous porcelain they began to covet. A light table showed how translucent the material was, compared to the traditional pieces. Soon, there was so much available porcelain in Amsterdam that even the growing middle class could afford to get in on the action. Tea also started being considered fashionable, even above its use as medicine, and the iconic Delft style that so many think of when Amsterdam is mentioned would never have come into being without the Asian import trade. Right: Palampore. Deccan, India, 1710-1750. 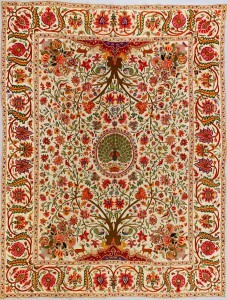 Cotton embroidered with silk and metal-wrapped threads. Peabody Essex Museum, Veldman-Eecen Collection. Photo by Fotostudio John Stoel. All class levels seemed to be getting into the Asian Import collecting: wealthy women sported exotic pearls and diamonds mined in India and Borneo; middle class merchants and tradespeople collected porcelain; and even famous master painter, Rembrandt van Rijn, had countless artifacts from the east. The show boasted three etchings from Rembrandt, though here he was cast in the role of collector rather than master artist, an interesting facet in the overall show. Perhaps one of my favorite parts of the exhibition though was the section aptly dubbed ‘Fashionistas’. In this sumptuous red room the viewer is surrounded by items of immense value and shows how ‘wearing Asia’ was prized in the Netherlands. Lightweight materials such as cotton and chintz were prized in a land that had only ever known heavy wool and linen, and men began wearing Japanese gowns around the house, known in the west as ‘banyan robes.’ Every piece in the gallery is exquisitely preserved, thanks in large part to the collections that held them. Asian creators also started to tweak their work to better suit the desires of their western patrons. English motifs would be incorporated into designs, such as in the example, above right. While the interior designs of the peacock and other animals are distinctly Asian in execution, in each corner there has been placed a very western style vase of flowers. The VOC began submitting commissions to Indian artisans to incorporate into their work to expand the appeal of their trade goods and to great success. Left: Rembrandt van Rijn. 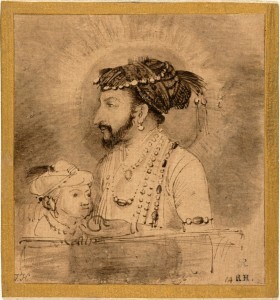 Shah Jahan and his Son, 1656-1658. Ink on Japanese paper. Rijksmuseum, Amsterdam. 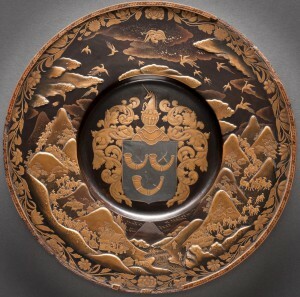 Gift of J. G. Bruijn-van der Leeuw, Muri, Switzerland. Courtesy of Rijksmuseum, Amsterdam. 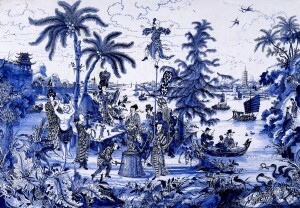 Dutch art also took many liberties utilizing asian styles and designs in their new work, utilizing the blue and white of Chinese and Japanese porcelain in their Delftware, stylistic choices in rendering animals and landscapes on ceramics as well as deliberately including Asian items in still life paintings. While today, borrowing stylistic choices is delicate work, historically, art influence was extremely fluid. When asked about whether or not she foresaw any issue that might be taken with the exhibition promoting acts of ‘appropriation’, Corrigan said she didn’t think much about that in her primary studies. After the opening of Native Fashion Now (which recently closed at the PEM) however, she was interested in seeing how people would react to this extremely important part of history. Right: Pieter Claesz. 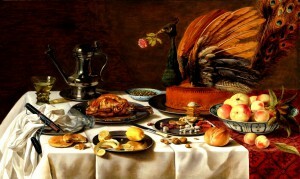 Still Life with Peacock Pie, 1627. Oil on panel. 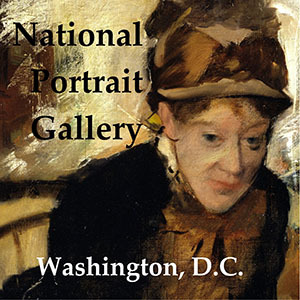 National Gallery of Art, Washington, The Lee and Juliet Folger Fund. Courtesy of National Gallery of Art, Washington. Closing out the exhibition are three contemporary pieces by Dutch artist Bouke de Vries, leaving the viewer with a poignant reflection on the luxuries of this show enveloping them. The artist calls two of them his ‘memory vessels’, and they are comprised of broken shards of Asian porcelain and Dutch Delftware framed in glass jars, recreating the shape of the original ceramic. Paired with his final piece, Homeland Blue and White, which makes up a map of the 17th century Dutch Republic (also using ceramic shards), the artist reflects on the dualistic nature that this relationship had on both cultures — beauty built on fragility and, oftentimes, force. This period in history left an indelible mark on both sides of the world and reaches into modernity. Left: Plate with the coat of arms of Wilem van Outhoorn. Japan, about 1700. Wood covered in lacquer, with gold foil. Peabody Essex Musem, Salem. © 2009 Peabody Essex Museum. Photo by Walter Silver. Karina Corrigan has brought the Peabody Essex Museum’s already impressive collection of artifacts new life in a masterful narrative, emphasizing the impact of cultural exploration, both positive and negative. 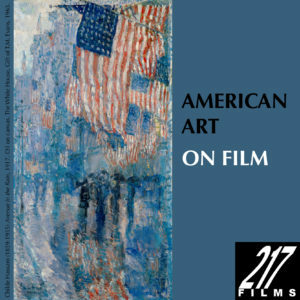 The viewer leaves with a new view of an oftentimes overly-simplified era, immersed in the sounds, smells, and sights of a time, when halfway around the world was just a little bit closer than it had been before.